Ask Dr. Sudoku #16 – V for Victory? Q: Are you going to write about your experiences in Prague this year? Did you expect you would ever win the World Puzzle Championship? 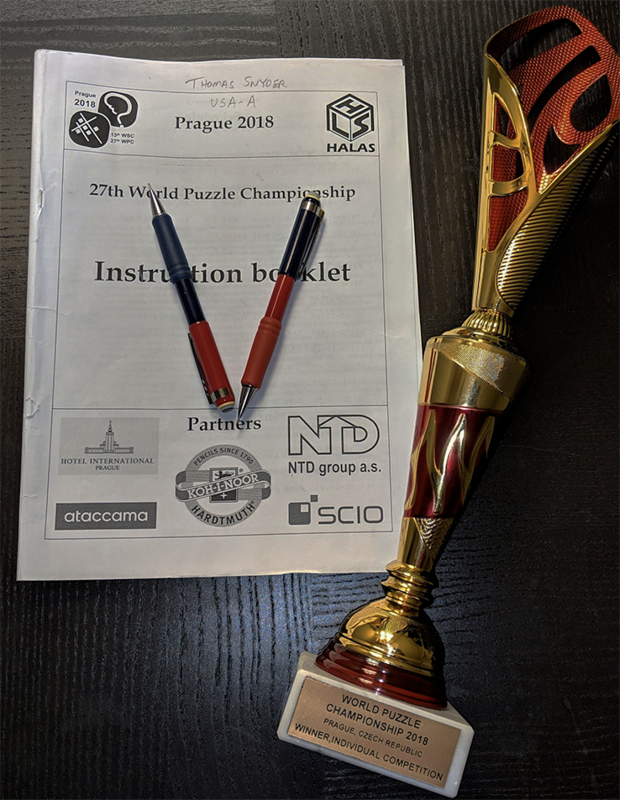 Several people have asked if I would write a report on my experiences this year as I finally became World Puzzle Champion. Long ago, before I started this site, I would frequently write live blogs during or shortly after puzzle events, capturing the “heat” of competition. Some wanted to see me write an epilogue, after so many close runner-ups, to conclude a chapter in my life. Many of these championship stories (when posted in the late aughts) were the first ways people learned about me. I now prefer to let my own volume of written and edited puzzles speak more for me. The live blogs capture my moments of great success and also great failure, as someone writing with full transparency and passion about what it is like to compete. I shared photos of “dirty laundry” — the stupid mistakes a competitor can make. I gave complaints earned and unearned against event organizers (the “So yeah, [insert event] happened” posts). I wrote an open letter that led to disqualifying a cheater and another that unfortunately did not lead to any WSC competition changes and continuing questions about what a Sudoku is almost 10 years later, …. I stopped posting on that blog in 2013, with a primary focus on my own scientific career and a secondary focus on growing GMPuzzles. The reconnecting with science jobs was a major reason I stopped going to competitions from 2014 until 2017, “retired” from competitive puzzling in a sense. I never fully explained that choice, and I’ve never explained a few things that have had the most impact on my adult life. I’ve separated my very public “puzzle life” from my private life. This time it is hard for me to answer questions like “did you expect you could win this year?” or “how does it feel?” without starting from a more private angle. For the very private and introspective angle, continue here (note: some sadness/personal loss covered). To go straight to the competition report, click here. The Playoff story and video annotation is here.